"3LA1, V-2095" by Timothy K. Perttula and Robert Z. Selden Jr. CONTEXT INFORMATION: From a grave (Burial B) in a cemetery excavated by Glenn Martin in 1940. Associated vessels in the grave are V-2092 to V-2094 and V-2096 to V-2097. DECORATION: The rim has three rows of diagonal incised lines, with horizontal brushing marks between the incised rows. The body has a central broad trailed circle, repeated four times around the vessel, that encloses a cluster of three appliqued nodes. Each trailed circle and appliqued node cluster is separated from the other by large trailed triangle elements pendant from the rim-body juncture; each of the triangles is filled with circular punctations. Foster Trailed-Incised, var. 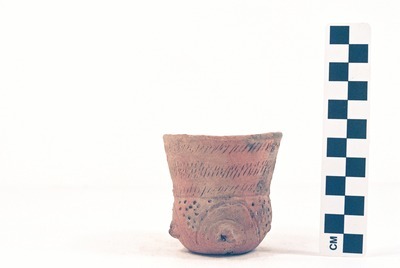 unspecified jar from the Wm. Handy Place (5425-2029).